This month, Bright Spark, in partnership with Western Electric, was honored to present the 2017 Bright Spark Invention Concept Award during the 2018 SURGE Chattanooga event held at Chattanooga State College. 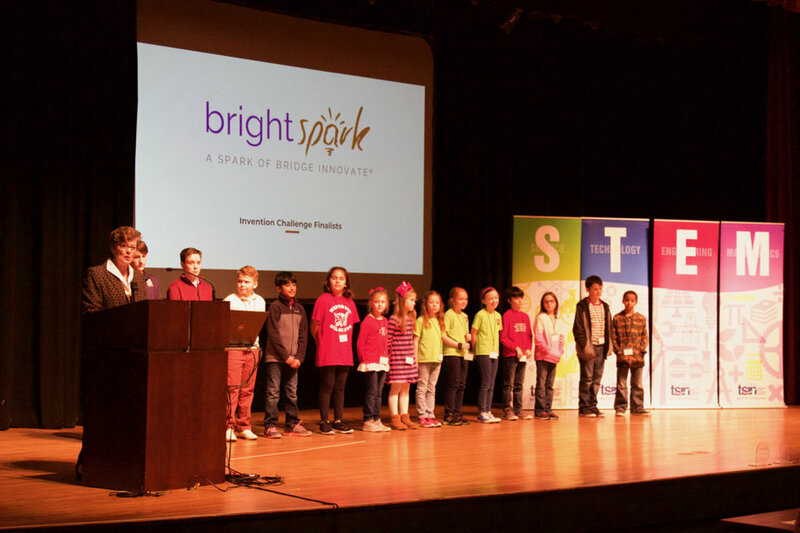 The award presentation was the culmination of Bright Spark’s 2017 Invention Challenge where K-12 students put their ingenuity to the test by inventing solutions to everyday dilemmas. It was an exciting day that left us all inspired! Check out what the press had to say. Our 2017 Invention Challenge Winner is Drew Snyder from Westwood Elementary School. Drew's idea, Easy Basketball Goal Lift, uses a bike pedal mechanism to enable anyone to move the goal up and down easily. His creativity in meeting a need won him the Invention Concept Award and the $500 prize, funded by Bridge Innovate and Western Electric. Congratulations, Drew! You inspired us to ignite innovation in our minds and to help others. 2017 Invention Challenge Winner Drew Snyder with his Easy Basketball Goal Lift invention. We also want to take the opportunity to recognize each of our finalists for their wonderful work. These students delivered creative designs and are one reason why Bright Spark is able and excited to continue the Invention Challenge in 2018. What problem does your invention solve? Many times people want to use binoculars, but need their hands free for other things (guns, walking sticks, food or drink, and drawing materials). The binoculars allow people to have their hands free so they can do two or three things at once. Straps can be adjusted. People who are slow will be able to get where they are going more quickly and without having to work out to get faster. Getting to school late. That you can't travel to another place but you want to go there. Getting somewhere on time and you can go fast. The remote control brush would make it possible for the elderly (or anyone who is not capable of getting down on the floor) to deep clean their floors. The hoverer allows you to move from place to place without having to worry about traffic and parking. It hovers above the ground (which eliminates the problem of difficult terrains) and it doesn't have wheels. My puppy is not very well trained and runs away, so this fixes the problems of losing your dog, not seeing your dog in the dark, and helps train your dog. Beginning in February 2018, the Invention Challenge will resume taking monthly submissions. Each month, the submission with the highest number of Facebook likes and shares will be declared a finalist. The group of finalists from each month will then be eligible for the 2018 Annual Best Overall Design Award for 2018. Stay tuned for more information from Bright Spark about for the next round of the competition soon! A big part of Bridge Innovate's is about equipping leaders with innovative solutions and strategies for breakthrough ideas. As a spark of Bridge Innovate, Bright Spark trains and enables our community of students and educators to use design thinking. Bright Spark’s Design Competitions give students a platform to showcase their creativity, as well as connect them to industry leaders who are passionate about investing in the next generation of innovators. If you or your organization is interested in partnering with us, sponsoring a student team, serving as a mentor or competition judge, or joining the competition please contact our Bright Spark Director, Mary Kim.